Via Episcopal News Service. 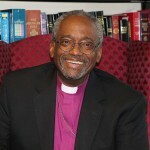 A video (the official broadcast from the BBC) and the full text of Presiding Bishop Michael Curry’s sermon at the royal wedding of Prince Harry and American actress Meghan Markle follow. And now in the name of our loving, liberating, and life-giving God, Father, Son, and Holy Spirit. Amen. neither can floods drown it (out). There’s power in love. Don’t underestimate it. Don’t even over-sentimentalize it. There’s power, power in love. If you don’t believe me, think about a time when you first fell in love. The whole world seemed to center around you, and your beloved. Oh, there’s power, power in love. Not just in its romantic forms, but any form, any shape, of love. There’s a certain sense, in which when you are loved, and you know it, when someone cares for you and you know it, when you love and you show it, it actually feels right. There’s something right about it. And there’s a reason for it. The reason has to do with the source. We were made by a power of love. And our lives were meant, and are meant to be lived in that love. That’s why we are here. Ultimately the source of love is God himself. The source of all of our lives. 1st John in the New Testament says it this way. There’s power in love to help and heal when nothing else can. For love, it’s as strong as death. But love is not only about a young couple. Now the power of love is demonstrated by the fact that we’re all here. Two young people fell in love, and we all showed up! But it’s not just for and about a young couple who we rejoice with. You shall love the Lord your God with all your heart, all your soul, all your mind and all your strength. This is the first, and great commandment. And the second is like it. Everything that Moses wrote, everything in the holy prophets, everything in the Scriptures, everything that God has been trying to tell the world! And while you’re at it, love yourself. Someone once said that Jesus began the most revolutionary movement in all of human history. A movement grounded in the unconditional love of God for the world. And a movement mandating people to live that love. And in so doing, to change not only their lives, but the very life of the world itself. I’m talking about some power. Power to change the world. Oh, that’s the balm in Gilead! This way of love, it is the way of life! They got it! He died to save us all! He didn’t die for anything he could get out of it! Jesus did not get an honorary doctorate for dying! He wasn’t getting anything out of it! He gave up his life, he sacrificed his life for the good of others, for the good of the other, for the well-being of the world, for us! Love is not selfish and self-centered. And in so doing, becomes redemptive. And that way of unselfish, sacrificial, redemptive love, changes lives. And it can change this world. If you don’t believe me, just stop and think, or imagine. Well, think and imagine a world where love is the way. Imagine this tired old world when love is the way. When love is the way, unselfish, sacrificial, redemptive. When love is the way, then no child would go to bed hungry in this world ever again. When love is the way, poverty would become history. to study war no more. When love is the way, there’s plenty good room. Plenty good room. For all of God’s children. And when love is the way, we actually treat each other – well, like we’re actually family. When love is the way, we know that God is the source of us all, and we are brothers and sisters. Children of God. My brothers and sisters, that’s a new heaven, a new earth, a new world. And let me tell you something, old Solomon was right in the Old Testament, that’s fire. Teilhard de Chardin–and with this, I will sit down, we gotta get you all married. French Jesuit Teilhard de Chardin was arguably one of the great minds, great spirits of the 20th century. A Jesuit, Roman Catholic priest, a scientist, a scholar, a mystic. In some of his writings he said, from his scientific background, as well as his theological one. Some of his writings he said, as others have, that the discovery, or invention, or harnessing of fire was one of the great scientific and technological discoveries in all of human history. Fire to a great extent made human civilization possible. Fire made it possible to cook food, and to provide sanitary ways of eating, which reduced the spread of disease in its time. Fire made it possible to heat and warm environments and thereby made human migration around the world a possibility, even into colder climates. Fire made it possible – there was no Bronze Age without fire. No Iron Age without fire. No Industrial Revolution without fire. The advances of science and technology are greatly dependent on the human ability and capacity to take fire and use it for human good. Anybody get here in a car today? An automobile? Nod your heads if you did, I’m guessing, I know there were some carriages. For those of us who came in cars, fire, and the controlled, harnessed fire made that possible. I know that the Bible says, and I believe it, that Jesus walked on the water, but I have to tell you, I didn’t walk across the Atlantic Ocean to get here! Controlled fire in that plane got me here! Fire makes it possible for us to text and Tweet and email and Instagram and Facebook and socially be dysfunctional with each other! Fire makes all of that possible! And de Chardin said fire was one of the greatest discoveries in all of human history. And he then went on to say that if humanity ever harnesses the energy of fire again, if humanity ever captures the energy of love, it will be the second time in history that we have discovered fire. The redemptive power of love. And when we do that, we will make of this old world a new world. God love you, God bless you. in those Almighty hands of love.